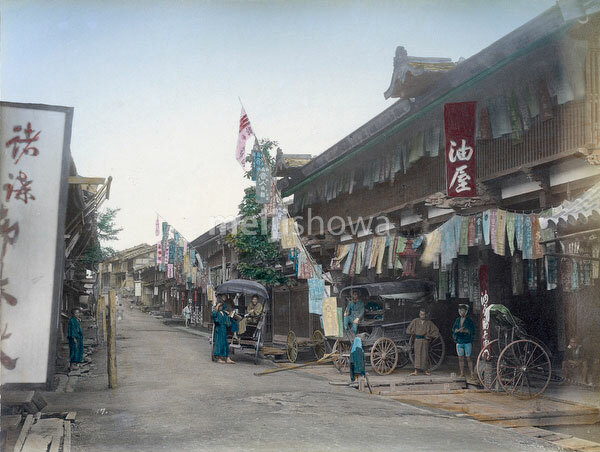 Post town inns at Oiwake Juku (追分宿) in Nagano Prefecture around 1880 (Meiji 13). The town was the twentieth of the sixty-nine shukueki (way stations) of the Nakasendo, one of the two routes that connected Edo (modern-day Tokyo) to Kyoto..
Until the Shinetsu railroad line connected Naoetsu and Karuizawa in 1893 (Meiji 26), the town functioned as the junction between the Nakasendo and Kitaguni highways. Interestingly, in addition to a rickshaw, two stagecoaches are visible. Because the road was paved on this stretch of the Nakasendo, this for Japan extremely rare form of transportation was offered from 1870 (Meiji 3) to 1890 (Meiji 23).